You need speak up, Sleepy Hollow residents. And so do your kids. Clear your calendar and bring the family. 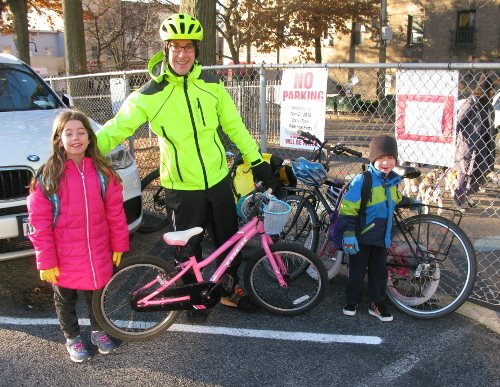 Since kids consider school to be work, we'll organize rides to there. Bike to WI & Morse on February 8. Free donuts & hot chocolate! Meet at 6:50, Union Ave & Kerwin Pl. Ride down the hill to WI, then over to Morse. Getting home to the Crest is up (no pun intended) to you. Meet on the corner of New Broadway and Maple St. The Webber Park crews will also ride home together. If you're coming, reply to this email so we can get proper quantities of refreshments. Going to ride from another neighborhood or to another school? Let us know. In the spring, the kids rising to the upper school get picked up by the older students, then they all bike in celebration along this car-free street to the new school. And speaking of school... We just held a great* presentation, plus Q&A, with a social studies class in Scarsdale High School. It was about the importance of transportation and the Route 9 Active Transportation study. If you'd like this for your (kid's) class, please reach out to us. All of Westchester County's Bee-Line buses will have bike racks on them by the end of this summer! An increasing number of cities are showing they care about public safety* by handling sidewalk snow removal. It doesn't cost a lot of money, either. In (very snowy) Rochester, it costs each homestead an average of $35. (That's what'd cost you to hire someone to shovel just a couple snowfalls!) We can fund it via a small separate fee on our Village water bills (which is how Sleepy Hollow charges for garbage collection), so it's outside the Property Tax Cap. Leaving shoveling up to property owners results in dangerous, sometimes impassable conditions. Imagine if we required home owners to shovel the streets! Sidewalks are public property. ** We need to make walking a public priority. ** Property lines generally end before the sidewalk. Don't believe us? Look at the survey you got when you purchased your home.